Acclaimed author Jason Aaron (Astonishing Spider-Man and Wolverine, Weapon X) and superstar artist Renato Guedes (Action Comics, Adventures of Superman) launch an all-new ongoing Wolverine series as Wolverine goes to hell... literally! 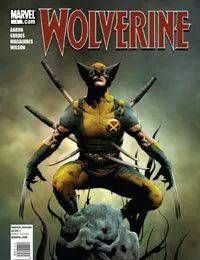 Someones out to destroy Wolverine-permanently-and they may have succeeded. But if Wolverines soul is in hell, how is his body terrorizing those closest to him?